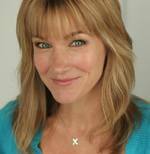 Nov 17 Call Answered: Carol Linnea Johnson: Three Day Hangover: Tartuffe! Carol Linnea Johnson I first met Carol Linnea Johnson when I saw The Full Monty on Broadway in 2001. After six wonderful viewings, I followed Carol to her next gig in Broadway's Mamma Mia! With her powerful vocals, Carol brought down the house as "Donna." Carol then left Broadway for Vegas' Mamma Mia! and we lost touch. With the invention of Facebook, we got back in touch, and now it's great to have the chance to really sit down with Carol and catch up! Carol is starring in Three Day Hangover's re-imaged version of Moliere's Tartuffe! In this production, this play is set against a political backdrop which makes it outrageous, up-to-the-minute contemporary and hilarious. The colorful characters and over-the-top rhetoric in the current national political spotlight have added fuel to Three Day Hangover's fire. As always, they've incorporated drinking game shenanigans, which fit perfectly into the dysfunctional family dynamic at the center of the story. Moliere's searing comedy of hypocrites and heathens have been re-imaged for our modern age and nothing brings out the best kind of worst in people like a U.S. Senate race. Coming at you from the left and the right, this fast-paced, dysfunctional family farce will be anything but politically correct as we roast and toast American politics as unusual. Tartfuffe plays at McAlpin Hall at West Park Church in NYC (86th Street & Amsterdam) through November 21! Show time is 8pm! Click here for tickets! For more on Carol be sure to follow her on Twitter! For more on Three Day Hangover visit http://www.threedayhangover.com and follow them on Facebook and Twitter! Carol Linnea Johnson and Sean Tarrant in Three Day Hangover's "Tartuffe! ", Photo Credit: Lloyd Mulvey1. You are currently starring in Three Day Hangover's re-imagining of Moliere’s Tartuffe! What made you want to be in one of their productions? I have been a HUGE fan of this company since I saw their first production, The Hamlet Project. They take classical plays that we have all seen 100 times and rediscover them in hilarious and very meaningful ways. I thought, "This is what it must have felt like to be one of Shakespeare's groundlings!" Three Day Hangover are geniuses at elevating the material by trusting the audience and giving them ownership of the show. Plus, I enjoy what adult beverages do to a group of consenting adult theatre goers. It feels good to be a little bit bad! Cast of Three Day Hangover's 'Tartuffe! ", Photo Credit: Lloyd Mulvey2. This production of Tartuffe is being set against a political backdrop. How do you think Moliere would react to this re-imagining? I think he would LOVE IT!!! Tartuffe was banned when it was first written because it called out the religious and political hypocrites of it's time. Jake Brandman, our amazing playwright, and Beth Gardiner, our genius director, took that to heart and have made this as politically charged as a FUN evening of theatre will allow. There is an excellent balance of "I can't believe they just said that" and "I wish I could say that out loud without getting fired, unfriended, and/or broken up with." 3. What do you identify with most about this re-imagining story? I love plays about people who's passion makes them go to the extreme. There is a lot of joy in being completely myopic! In my day to day life, I actively try to be a good listener, respect where people are coming from, and try to be a good role model for my daughter. As "Olga," I don't have to worry about any of that! It is extremely cathartic. It's like being in your own personal episode of Arrested Development! Carol Linnea Johnson and Tom Schwans in Three Day Hangover's "Tartuffe! ", Photo Credit: Lloyd Mulvey5. What has been the craziest thing to happen so far during the run of Tartuffe? An audience member literally slapped "Tartuffe" (Tom Schwans) on the bum last week. I am not going lie, Tom was kind of asking for it! 6. 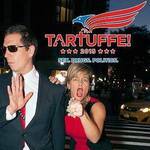 Since this version of Tartuffe is set to a political back-drop, if you were running for president, what are some things in this country you would like to see improved? Easy. MORE ARTS FUNDING!!!!! 7. On that same front, a lot of past secrets of candidates come to the forefront during their campaigning. If you had a campaign going right now, what past secrets do you think would be revealed about you? Ummm, I had a lot of fun in my 20's and 30's. A LOT OF FUN. Thank GOD there was no Facebook in the late 90's/ early 2000's....That said, I REGRET NOTHING! Carol Linnea Johnson in "Mamma Mia!"8. We came to know each when you were in The Full Monty and then I saw you in Mamma Mia! You left NYC to go to Las Vegas to be in Mamma Mia! What was it like to leave the bright lights of Broadway for the neon lights of Vegas? When did you decide to come back home to NYC? What has your return home been like? I loved my time in Vegas! The Mandalay Bay had an incredible theatre and the people who were in that company were some of the most talented and kind people I have ever had the pleasure to work with. Vegas is a VIP town and Mamma Mia! was really popular so we got to do all sorts of amazing Vegas-y things. The best part was the fact that my husband, Don Burroughs, and I got to do the show together. It was a really great time for our whole family. We all love that dessert sky and dry heat! After Mamma Mia! closed in 2009 my husband, daughter, and I stayed for a year and a half. I was singing with a gypsy jazz band called "Hot Club of Las Vegas" and it was a beautiful time. Ultimately, my husband and I were flying back to NYC every other month to audition for things so it made sense to move back. Also, I really wanted our daughter to grow up with the culture and diversity of NYC. Since we've been back we have worked really hard to find the balance between work and family. I find that I am drawn to projects with a shorter time frame so I can be home more. Carol Linnea Johnson in Three Day Hangover's "Tartuffe!"9. As someone who’s starred in The Full Monty, the final song in the show is called "Let It Go," (and no this has nothing do with the Disney version), what is something you want to "Let Go" of? Ooooh, Adam! This is getting REAL! I think every day I have to remind myself that it is ok that I have pulled back from this business that I love so much to be more present as a parent. I feel like a traitor saying this because I know so many amazing parents who are balancing Broadway and family and it sounds like I am saying they are mutually exclusive! I am not. For now, slowing my pace allows me to take care of all the people I love in a more meaningful way. I get scared all the time that I will never work again and then something like Tartuffe comes along and I think, HALLELUJAH!!!! It is possible to have it all even if it is just for 6 weeks! 10. Another song in The Full Monty, was It’s A Woman's World. If you had to create a world of all women, who would you want to have live there with you (celebrity or not)? Right now I couldn't choose only women because then it would mean excluding the amazing men in my cast! I am so in love with this group of performers that I am already grieving not seeing them everyday and we still have a week left of performances! Once in a great while, the stars align and you get to make art with great artists. I think the love fest that the cast and creative team is experiencing comes through in the show. You can feel the love, "Simba." You can feel it tonight. Carol Linnea Johnson lives a double life as an actor and high powered volunteer at her daughter's school- both are equally glamorous. She has appeared on Broadway as "Donna" in Mamma Mia! (a role she also played on the Las Vegas Strip) as well as "Pam" in The Full Monty. 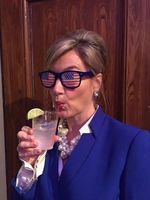 In NYC she has worked at Lincoln Center, with Three Day Hangover, Prospect Theatre and Titan Theatre Company's and further afield at the Alley Theatre, Globe Theatre, Barrington Stage, and Utah Shakespeare Festival to name a few. On-screen credits include Break Up At A Wedding (Before The Door Pictures), Law & Order, All My Children, and The Jerry Lewis Telethon. Recordings include Hot Club of Las Vegas featuring Carol Linnea Johnson. Carol is proud member of Actor's Equity Association.